A feel-good way to get rid of those pesky €500s! Most do not accept higher then 200€. And we are not allergic to cards, we just don't see any sense in paying money to carry around an additional piece of plastic to make a firm make money from our personal data. At least that is what I want to believe. You cannot compare to e.g. USA. Here you maybe get 1% "payback" in useless stuff. USA I know some things like gas can even give you 4% or 5% in "cash". Take it to Switzerland - it's no big deal there to by a SFr 2. loaf of bread with a 500 note! I had that problem in Shanghai, the smallest bill produced by ATM was larger than whatever the metro ticket machine would accept. 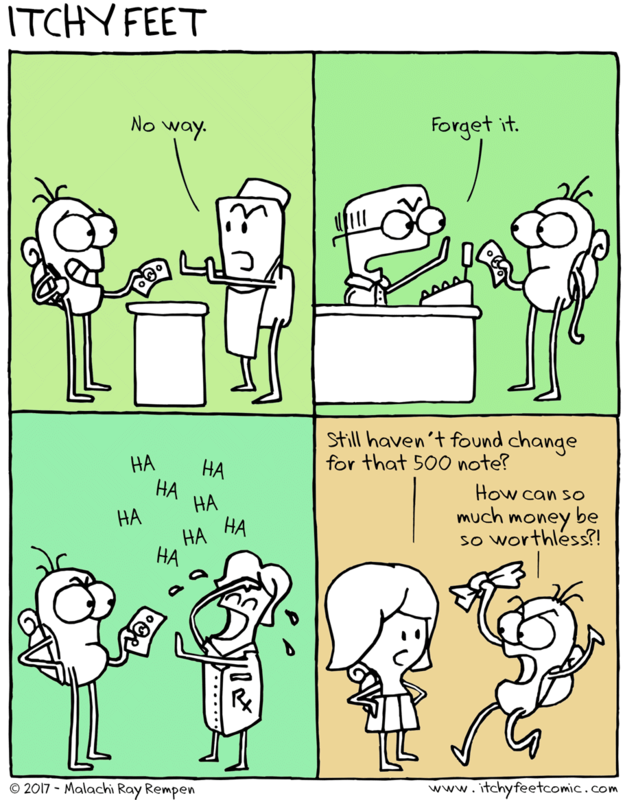 In Germany you'll have problems with 500 euro bills (or sometimes 200 euro) in shops, you can only bring them to the bank. Germans seem to be allergic to paying with cards? Really? I didn't know about that! Thanks for the information! The tip is good for those who plan their visit to German! I did get a laugh out of this cartoon - recognition humour:-) I lived in Frankfurt, the financal heart of Germany, for 25+ years and can say the following: given that I was working as a freelance teacher, I don't think I ever got to see a EUR500 note (! ), but if I had, I would have been hesitant about trying to "break" it in small or even middle-sized shops - I can imagine I'd have been asked "Don't you have anything smaller?" I would have saved it till I was in a large depsrtment store and even then I would have apologised profusely for offering it. One or two local corner shops and restaurants didn't yet have card readers but they were very much the exception rather than the rule. Over my quarter century there, I weaned myself off cheques onto paying by debit card in shops and by credit transfers for paying bills.